Black holes are stars that are supposed to have so much mass and small size that light can not overcome gravity and leave the star. Apparently, black holes are those objects of the Universe that attract the greatest attention of people. They are the stars of a large mass on the final stage of life. Black holes create such a strong gravitational field that absolutely can not reflect light. Thus for the observer, they seem black. Not emitting electromagnetic energy of any type, they can not be observed directly, and therefore it is so difficult to study their nature in detail, that you can begin to doubt their existence. But in recent years, there’s a sufficient evidence of their existence with sufficient confidence to determine the location of these objects in the universe. So, the object, that undergoes considerable compression, after a while, stops releasing light rays from itself. Radius, at which it starts to happen, firstly was calculated by Carl Schwarzschild. Apparently, he can be considered one of the greatest astrophysicists of the first half of the twentieth century. He contributes to many sections of astrophysics. After Einstein formulated his equations of the general theory of relativity, Karl Schwarzschild, shortly before his death, received for them the first exact decisions, describing, in particular, the properties of black holes. Schwarzschild was the director of the observatories in Göttingen and Potsdam; In 1916, at the age of 43, he died of illness, caught by him in the First World War. He was buried in the central cemetery in Göttingen. Radius, to which it is necessary to squeeze the object, so that light from it could not go into space, called the Schwarzschild radius. For The sun it is about three kilometers. If you squeeze the Sun to this or a smaller radius its light will not come out. Generally speaking, the Schwarzschild radius can be calculated for any cosmic object. The smaller the object weights, the smaller is a Schwarzschild radius. If an to calculate this radius for an average human, the Schwarzschild radius is so small that if expressed in centimeters, it will result in zero integers and another twenty one after the comma, and only further there will appear numbers other than zero. If the mass equal to the mass of a person is compressed to the so small radius the light will not leave the outer space from it. 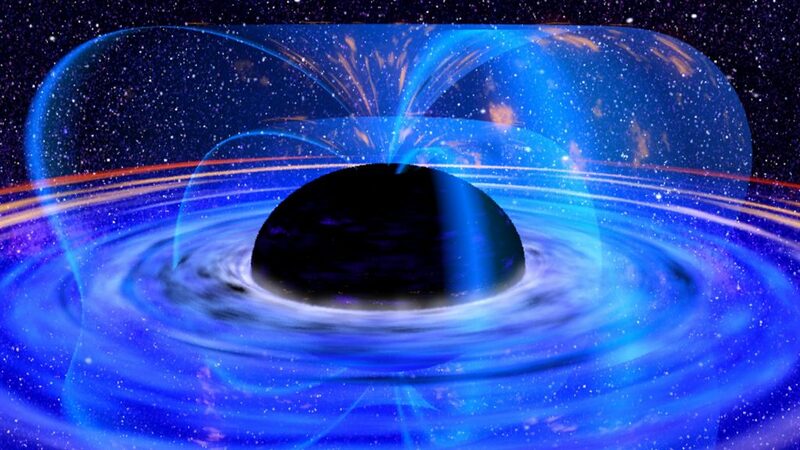 Turned into a black hole, the cosmic object does not disappear from the universe. It can be identified only by its enormous gravitation. A black hole absorbs light rays passing near it, and deflects rays, going from it at a greater distance. A black hole can enter into gravitational interaction with other objects: it can hold near itself planets or form a double system with another star. But for now this was all our thought experiment. Are there black holes in reality? Pretty hard imagine that the neutron star receives so much substance that its mass increases to the limit when the gravitational collapse occurs. In X-ray binaries, for example, substance flow to a neutron star is so small that for the entire lifetime of a star which gives its mass, the mass of the neutron star increases quite slightly. But what do we know about the origin of neutron stars?We know only that the pulsar in The Crab Nebula was formed after the explosion of the Supernova. And what do we know about Supernova explosions? Could it be possible sometimes after the expansion of the star shell there are remains of mass sufficient not only for the formation of a neutron star but also to further collapse it into a black hole? Regarding some X-ray binaries, there is a strong belief that a compact object that radiates X-rays is not a neutron star but a black hole. A substance that comes from a satellite star can warm up to the point that it begins to emit X-rays even before it becomes invisible in the depths of the black hole. By motion of the visible star, you can calculate the mass of the X-ray source. It is believed that the X-ray source Cygnus X-1 has the mass of a compact object that exceeds three solar masses. This compact object cannot be a neutron star; is it not a black hole? Dying stars turn into compact objects in which the substance is bounded forever. However, before they throw out a part of their mass there is a substance that can subsequently form new stars. Our own bodies consist of a substance that was boiling once inside the star. But almost always after the star collapse there remains a compact object, and finally all the matter in the universe will be concentrated in cooling white dwarfs, neutron stars and black holes, around which joyless cold planets will rotate. It seems that the universe will have a rather gloomy future. Previous Article← The First Human-Pig Hybrid Has Been Successfully Created.